Striking out former major leaguer Dwayne Murphy and finishing a two-hitter at single-A Modesto had Scott Chiamparino excited, The Modesto Bee noted, something he showed with shake of a clinched fist. "Tonight," Modesto manager Jeff Newman told The Bee, "I would say he had major-league stuff." "Champ very seldom shows emotion," Newman continued to The Bee, "but tonight when (he) struck out Murphy, he got a little excited. That was uncharacteristic for him, but he was showing his respect for a hitter who's been in the majors." Chiamparino was in his second professional season, taken by Oakland in the fourth round of the 1987 draft. And he was quickly becoming a prospect. In 16 starts for Modesto in 1988, Chiamparino posted a 2.70 ERA, earning a promotion to AA Huntsville. 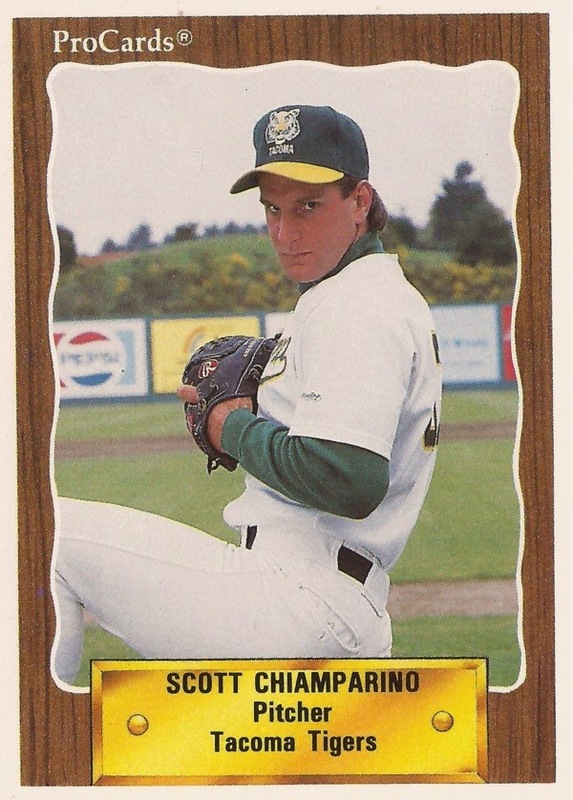 A promotion to AAA Tacoma, and Chiamparino shined, with a 13-9 record and 3.28 ERA. It was enough for the Athletics to pair Chiamparino and fellow Tacoma pitcher Joe Bitker and send them to the Rangers for consistent hitter Harold Baines. Chiamparino then got the callup to Texas. The Rangers appeared to have gotten a steal. Chiamparino's first 12 major league innings were scoreless, including seven innings with four hits and one walk against the Yankees. The streak then was swiftly broken in his next start; Chiamparino then gave up three runs before recording an out. In all, he went 1-2 in six starts, with a promising 2.63 ERA. Going into 1991, Chiamparino was even counted by an AP writer as among the elite rookies. Then came injury. Chiamparino had been the Rangers' fifth starter, but a sore elbow shelved him in May after going just two-thirds of an inning in a start. Surgery to remove bone chips and a spur led to ligament reconstruction surgery and the end of his 1991 season. His season in 1992 was already believed lost by April 1992 due to the elbow surgery. Then came another show of emotion, not necessarily on Chiampariano's side. Chiampariano suffered a cut to his chin after an April Fools joke gone bad, and a scuffle with Geno Petralli, according to the Baltimore Sun. Chiamparino recovered enough from his surgery by late 1992 to get back to Texas. In 25 innings, he posted a respectable 3.55 ERA, but went 0-4. He never returned to the majors. That November, the Rangers left him unprotected in the expansion draft, the Marlins picked him up. He never pitched in Florida's system. Returning for 1994, with the Padres, his prospects looked up. In six spring innings, his opponents hit just .167 off him, according to a wire account. Seven starts for AAA Las Vegas and Chiamparino's playing days were done. Chiamparino is still in baseball, but on the business end. He is now likely trying not to show emotion, at least during negotiations Chiamparino now works as a point man for super agent Scott Boras.